I was glad to hear that so many of you were interested in a tutorial for the Piped Pocket Skirt. I've done my best to create a printable pattern, and hopefully it will be helpful. This pattern is for an infant skirt, and I've tried to size it to be about a 3-6 month size, but you could easily adjust it to fit a larger or smaller baby by adjusting the length and the amount of elastic gather. You can find the printable pattern here. Print out the pattern full size on letter size paper. There are test squares on each of the pattern piece papers, so check to make sure that they are right around 1" to ensure proper scale. Adjust your print settings if necessary. Once your pattern has printed you will want to cut around the frame of pattern pieces 1a, 1b, 2a, and 2c. Match up the pattern pieces at triangles, and tape together. You can then cut out both pattern pieces 1 and 2. Pattern pieces three and four can be cut out without any matching. Gather your materials. 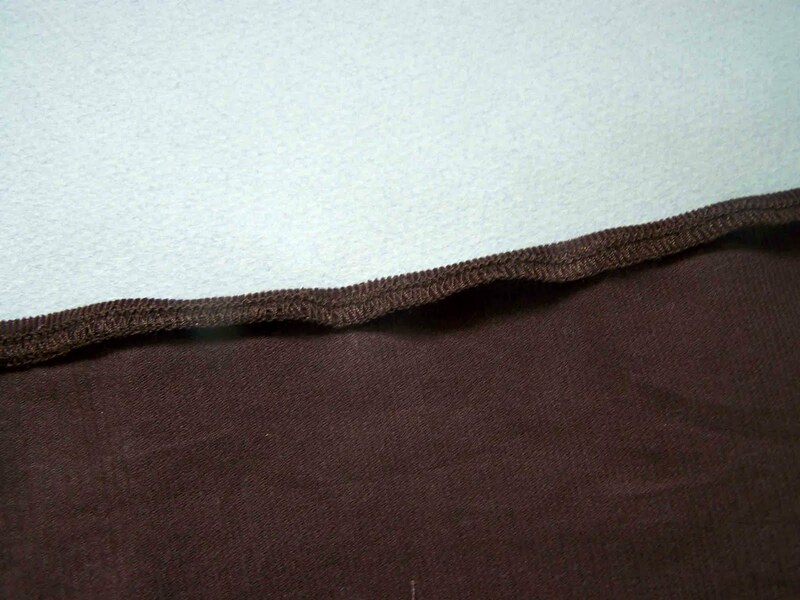 You will need one package of maxi piping, about one yard of trim, 6-8 buttons, 14" of 3/4" elastic, and 1/2-3/4 yard of fabric (I used corduroy), I'm pretty positive that 1/2 would do, but if you want to be safe go for 3/4 of a yard. Cut out your pattern pieces. 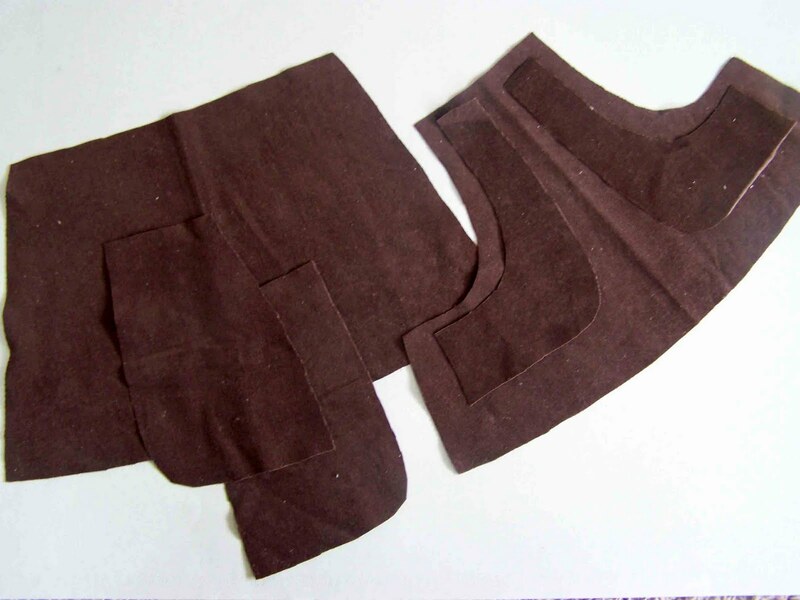 Both the skirt front and back skirt pieces are cut on the fold. 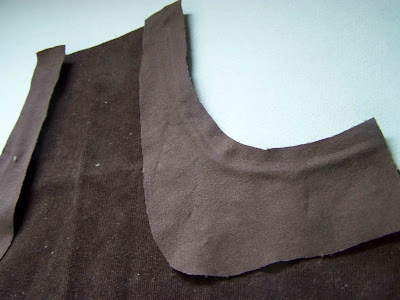 You will want to make sure that you cut two pieces of patterns 3 and 4. I cut 3 and 4 with the fabric folded so that my skirt pieces are opposite facing, you don't want two pocket linings facing the same direction. Next trim two pieces of piping slightly longer than the pocket arc on the front skirt panel. Take your cut lengths of piping, and pull the cord out about an inch and a half to two inches. Trim the cording, and ease the remaining cord back into the casing. 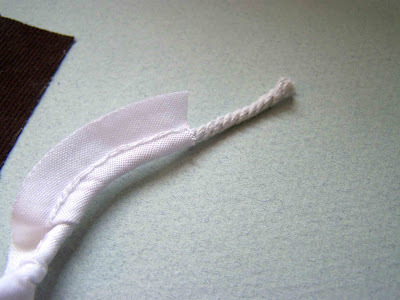 Removing a slight amount of the cording will reduce the bulk of the material when creating the casing for the elastic. 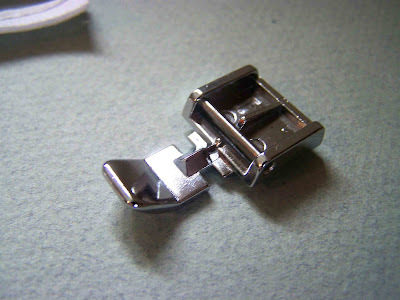 To attach the piping it is easiest to use a zipper foot. 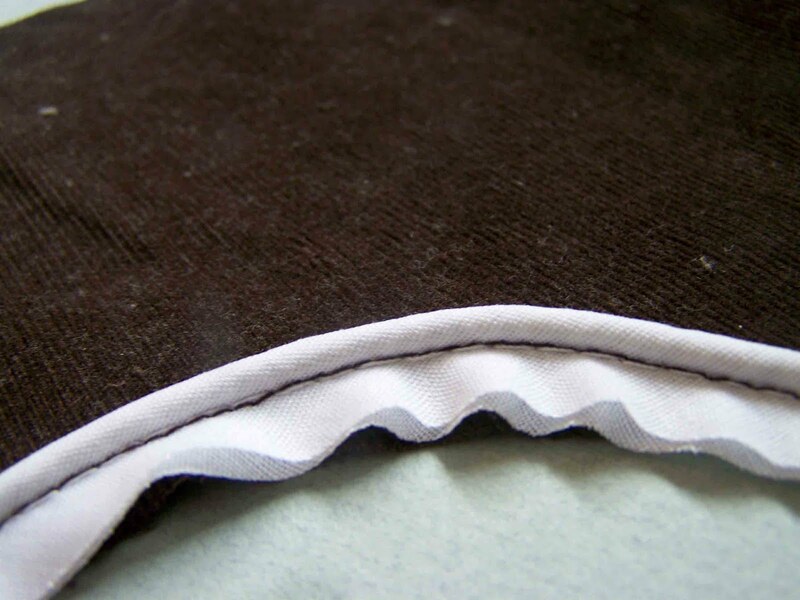 Line up the raw edges of the piping with the raw edges of your skirt panel. 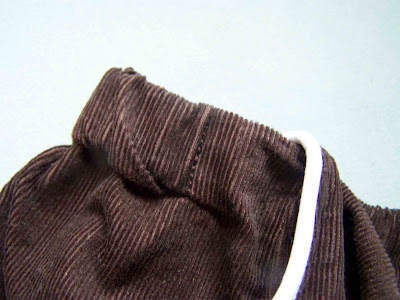 Position your material so that the cording sits just to the side of the zipper foot. 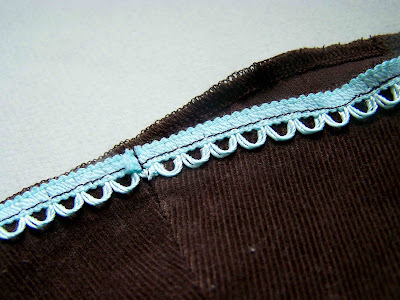 Stitch along the length of the piping, keeping it lined up with the raw edge of the skirt. Try to get your stitching just inside (cord side) the stitching on the piping, exposed piping stitching is a bit unsightly. Attach the piping to both sides of the front skirt panel. 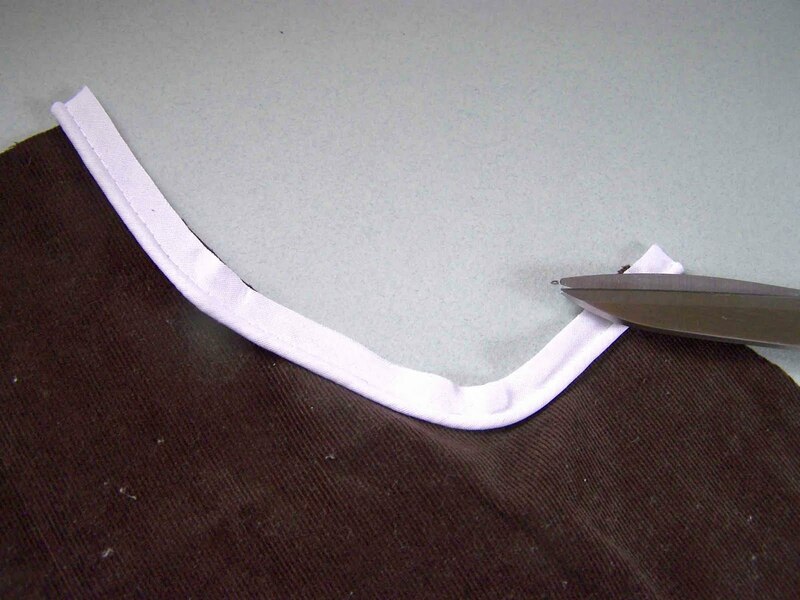 Now lay the pocket lining pieces on top of your front skirt panel. Right sides should be together. Stitch the pocket linings in place. 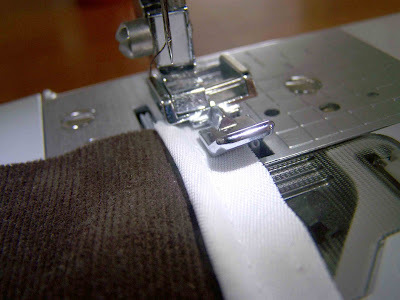 You will blindly be stitching along the same stitching line that you used for your piping. 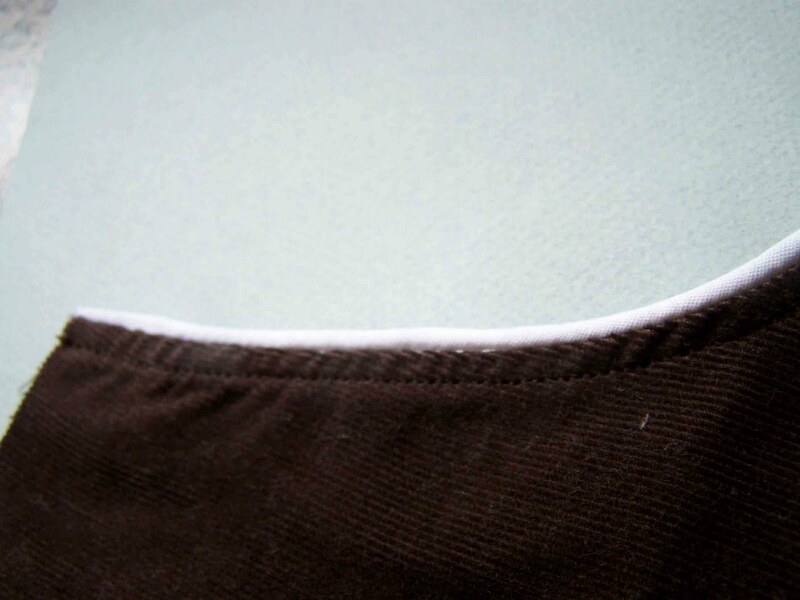 Feel your way through this seam. Clip the curves, turn and press the pocket lining so that wrong sides of material are now facing. 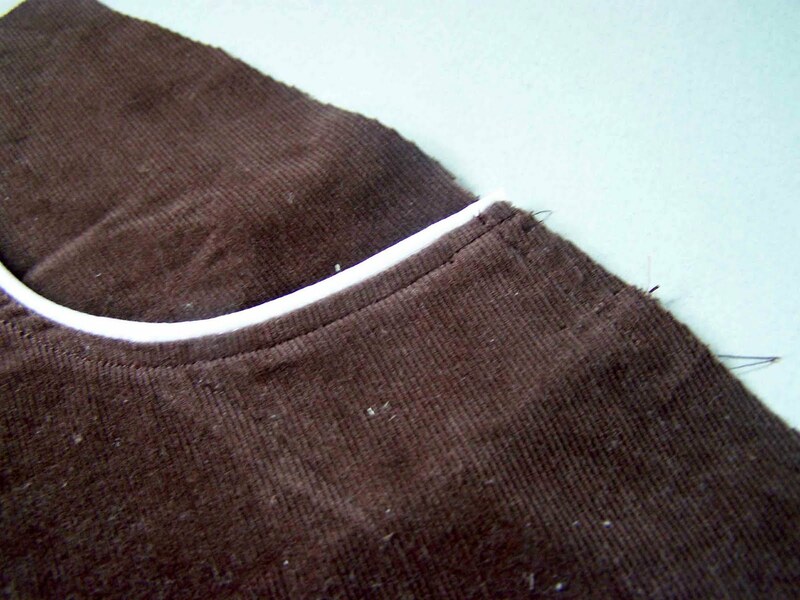 Once your pocket linings have been pressed, you can top stitch 1/8" to 1/4" away from the piping on the front panel. This will anchor both the piping and the pocket lining in place. 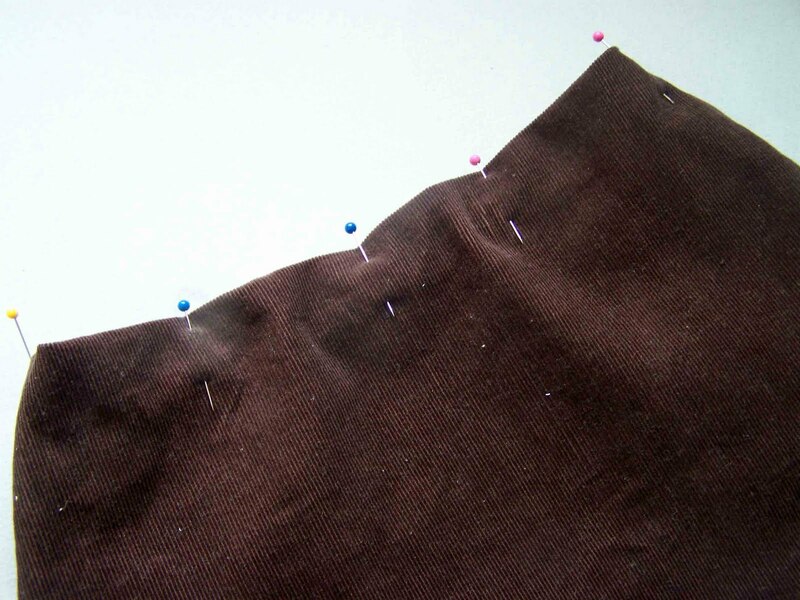 With the right side of your skirt facing down, pin the back pocket panel to the pocket linings. 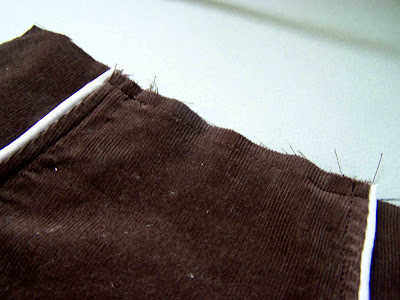 Use a 1/4" seam allowance to stitch in place. Use an overcast zig zag or serger stitch to finish off raw edges. Repeat on both pockets. Baste the back pocket panel to the front panel of the skirt at the top of the skirt, and at the base of the pocket (see below). Place the back skirt panel right sides together with the front panel. Pin in place and side seams. Sew side seams with a 3/8" seam allowance. Finish raw edges and press seam toward the back. Finish the raw edges of both the top and bottom hems of the skirt by using either a serger, pinking shears, or an overcast zig zag stitch. Note: I don't recommend pinking corduroy. 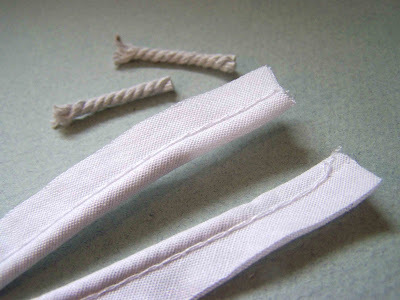 Apply a bit of fray check to the raw edge of your trim, allow to dry. 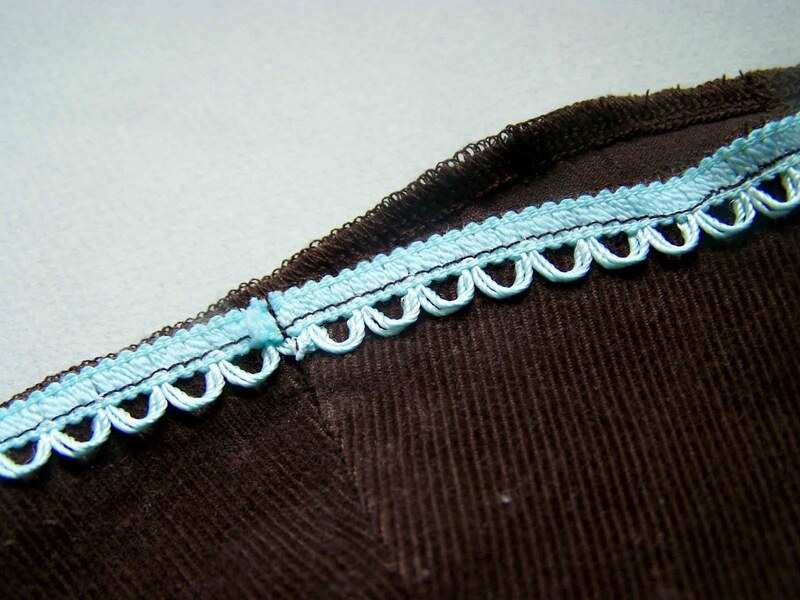 Attach your trim to the bottom of the skirt by lining up the lip of the trim with the bottom edge of the skirt. 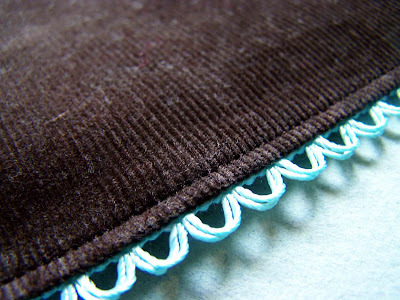 Stitch 1/8" away from the edge of the trim. 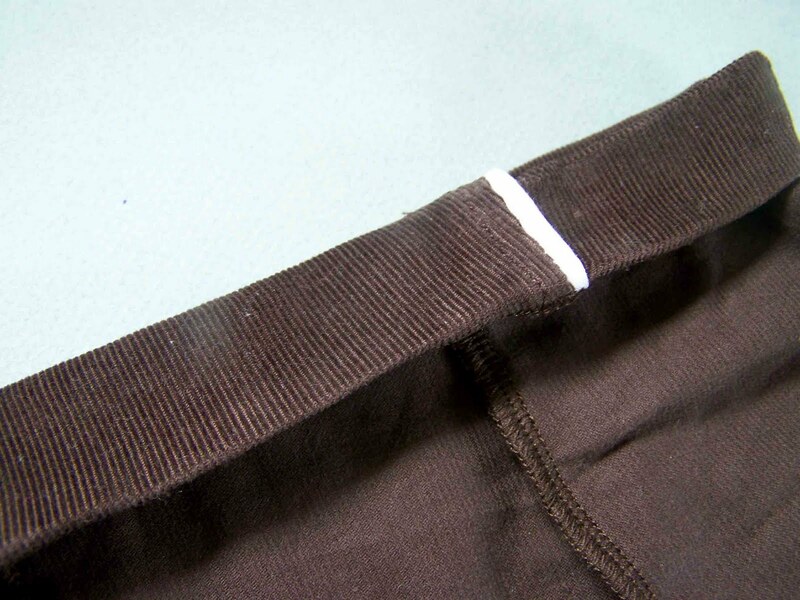 Attach the trim to the entire circumference of the skirt, overlap trim slightly, stitch down at seam, trim, and attach fray check to the new raw edge. Press the trim toward the back of the skirt so that the trim is exposed. Top stitch 1/8" away from the bottom hem. Press finished top edge under 1/4". 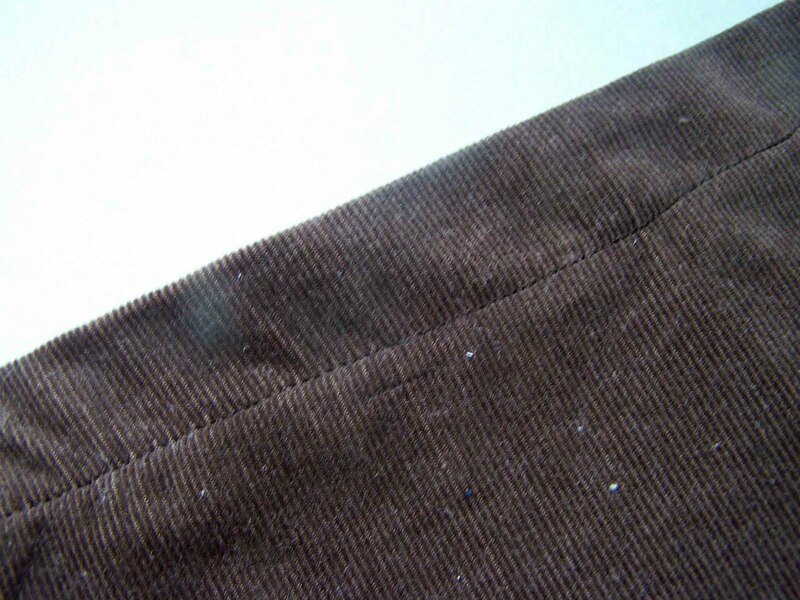 Turn edge under an additional 1" around the entire top of the skirt to create casing for the elastic. Pin the casing in place on the right side of the fabric. Pin the back of the skirt between pockets. 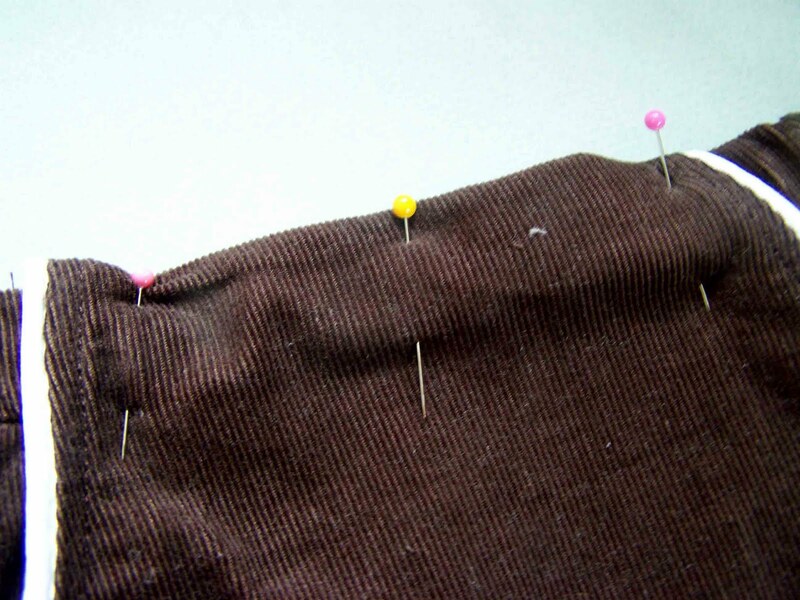 Leave the space on the front of the skirt between the piping, unpinned and sewn for the time being. 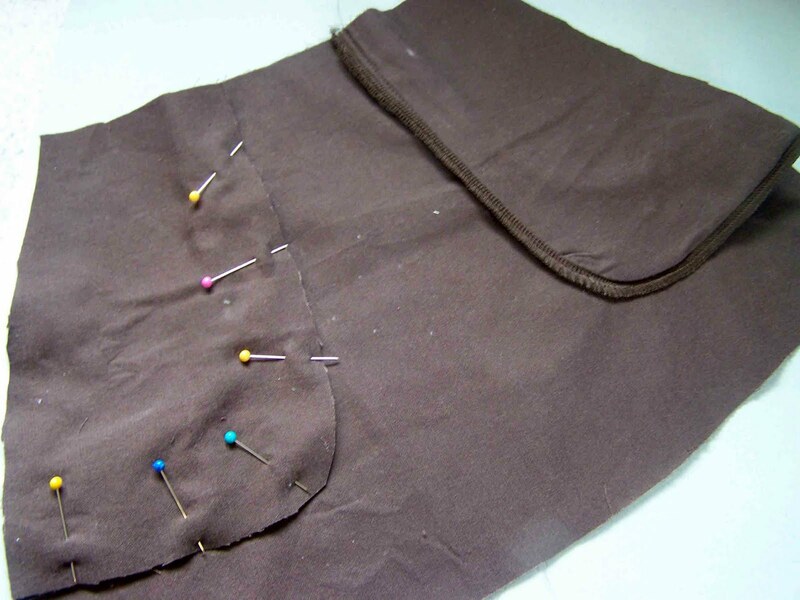 Stitch around the back of the skirt between pockets creating a casing that is just shy of 1". Thread 12" of elastic through the casing, leaving 1/2" overhang on either side. Adjust gathers. Triple stretch stitch your elastic in place. 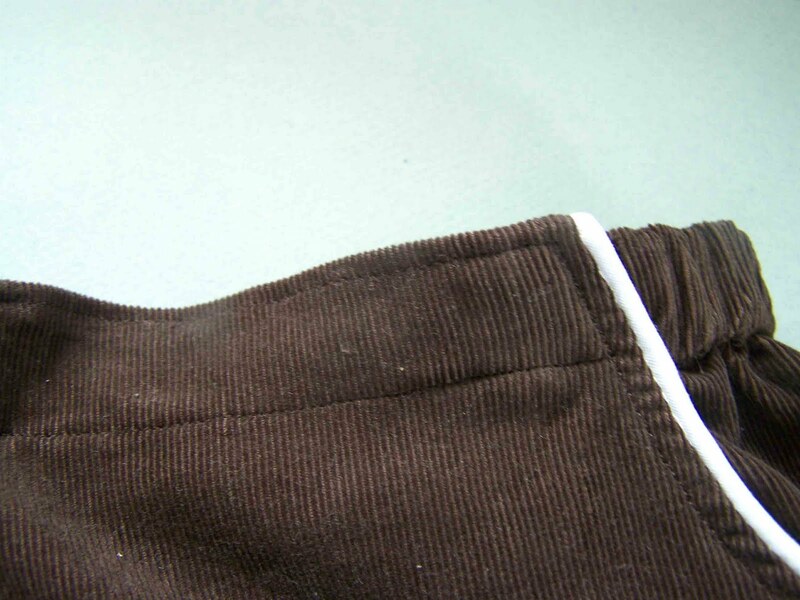 I tried to attach it so that when the skirt lies flat the stitching hides inside the pocket. 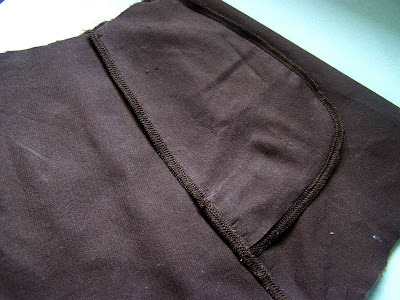 Once your elastic is attached, and your front panel is adjusted to overlap your stitching lines, pin the front panel to the unstitching casing. Stitch 1/8" away from the top of the casing, along the topstitching lines that run along the pockets, and 1/8" inside the bottom edge of the casing. This will create a nice flat front for your skirt. 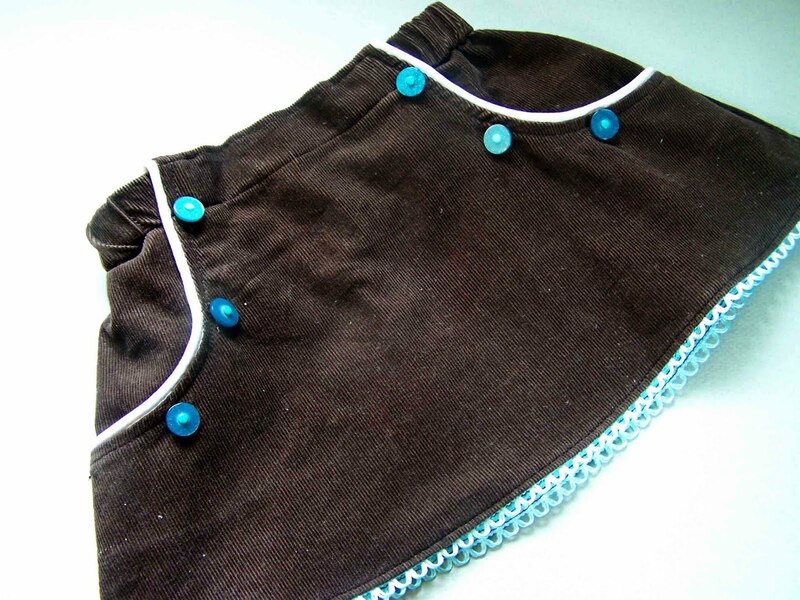 Attach buttons to the front of your skirt. Depending on the size of your buttons you may want to attach three or four to either pocket. I attached the first button at the casing line, and each subsequent button 1 3/4" apart. If you want you can attach the buttons through both the front and back panels of the pockets to keep them from opening up. 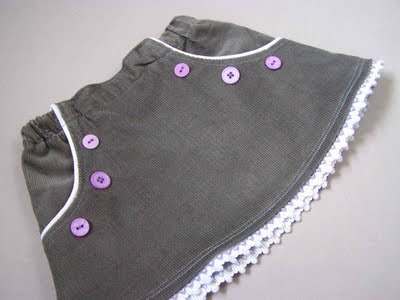 There you have it, a piped pocket infant skirt. Let me know if you have any problems with the links, the pattern, or questions about my tutorial. Sometimes it's hard to know how well you've really explained things. Thanks. Great tutorial. I think I'll make one of these for a friend who is expecting a baby girl. Oh my gosh! How I love this! So adorable. Thank you for the tute! Adorable!! I'm definitely featuring this! this is such a cute skirt! I love the piping and the buttons!! Hi, I have featured this lovely idea in a blog post called 20 ways with piping. Please check it out if you’d like. Love this tutorial. Thanks so much for sharing!